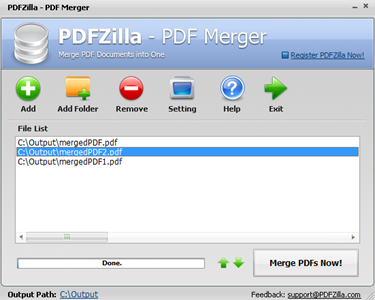 PDFZilla Version 3 software is a simple application to convert and merge PDF documents on Windows in just 3 clicks. It can also cut and rotate pages in the PDF along with converting a group of PDF documents into the required format like Word and Excel in a batch execution. All the supported features of the PDFZilla version 3 are on the Start Page. Navigation to the desired feature can be done easily. This page portrays features to convert PDF to Word, Image, HTML, SWF, TXT, EXCEL and conversion from Image to PDFs as well as the features to Merge, Cut and Rotate PDFs. PDF Merger feature has options to drag and drop files that are required to be merged or you can add one file at a time or a total folder of PDFs to be merged in Batch Mode processing. You also have the option to arrange the files to be merged in the order of your choice and remove files from the list. The page numbers remain the same as on the original PDFs even after merging. PDF Merger has a feature in the setting to Beep and alert after the files are combined. So, you can add a folder of PDFs to be merged and can carry on with other works and it will beep to remind you that the conversion is completed. Its execution is quick so mostly you do not need this feature unless there are 100s of PDFs to be merged. You always have a choice to have this setting or not. In addition to merging, PDF Rotating and PDF cutter are present. In PDF Rotator, a selected range of pages or all the pages can be rotated in 90 Degrees/ 180 Degrees/ 270 Degrees. Batch execution of a bunch of files can also be done at the same time. There is no option to preview the files before converting. In PDF Cutter, unwanted pages can be deleted and the page that is selected for deleting can be previewed before deleting. 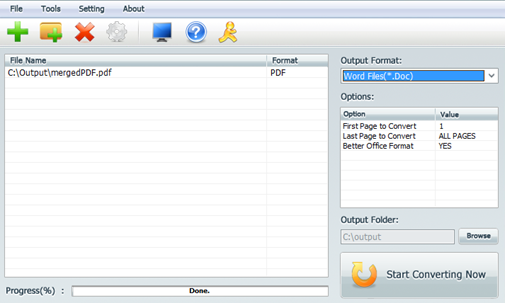 Only one PDF document at a time can be selected and even you can drag and drop the file that you need to be executed. PDFZilla Version 3 converts most of the image input file formats like Photoshop(*.PSD), Bitmap(*.BMP), JPEG(*.JPG), GIF(*.GIF), TIFF(*.TIF), PPM (*.PPM, Icon(*.ico), TGA(*.tga), and PNG (*.PNG) into PDF files. The software does not provide the feature to view the File that is converted to PDF from image or from PDF to other formats in the software page itself. It would be a nice addition if the converted files can be viewed on the page itself. In PDFZilla Version 3 there is no feature supporting PDF editing to add/delete data, add/delete images, edit font attributes or to place a digital signature. OCR (Optical Character Recognition) feature is not available in PDFZilla Version 3. 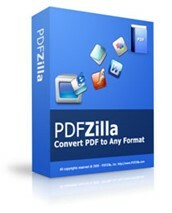 If this feature is supported, then PDFZilla Version 3 software can be more versatile and useful for business purposes. PDFZilla Version 3 version supported output conversion formats from PDF files are MS Word(*.DOC), Plain Text(*.txt), MS Excel (*.XLS), Rich Text (*.RTF), GIF(*.GIF), PNG(*.PNG), Bitmap(*.BMP), Flash(*.SWF), TIFF(*.TIF), Webpage(*.HTML) and JPEG(*JPG). ISO standard output format for long term archiving is not supported in this software. There is no supporting feature to convert a directly scanned file to PDF file. The scan feature is completely not present in this version. 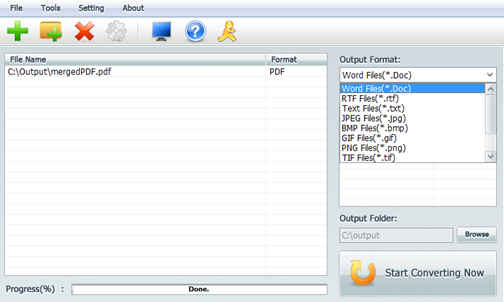 PDFZilla Version 3 can convert PDFs to Word, Image, Text, HTML, SWF. It can convert most of the supported input file formats to PDF files and convert PDF files into majorly used output formats like Word, Excel, PPT, HTML etc. The confusing part is that, when a PDF is converted into Word document, two versions of the same document are created where one is a word document with name <filename> and has only the written part with missing spaces between them and the other document is with name <filename_Office2000> with the data and the graphical content but the data is only half seen for some lines. The PDFs to be converted can be drag and dropped, a single file can be picked by browsing the path or a whole folder can be selected. 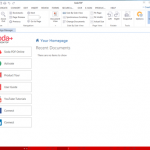 In addition, the PDFs page range can be selected to convert into other formats Other mostly used formats like Word and Excel cannot be converted into PDFs. Only image format files can be converted into PDFs. It also supports PDFs in German, Spanish, French, Italian and all Unicode Languages besides English. The feature for protecting the PDF files by setting a password is not supported in PDFZilla Version 3 making the documents vulnerable for unauthorized users access. The authenticity of the PDF file cannot be established because there are no features supporting Watermarking the background of the document nor an option for digital signatures. Moreover, confidential data cannot be redacted nor searched for in this version of the software and sharing of the converted PDF files is also not possible to cloud storage like Dropbox, Google Drive and even sending it through E-mail from the software directly. The single license of this software is priced at $39.95 USD and 2-4 licenses are priced at $37.95 USD each, 5-9 licenses are priced at $34.95 USD each and over 10 licenses are priced at $32.95 USD each. They accept all major credit cards along with PayPal. A free trial is version is allowed with limitations. A money back guarantees policy is not provided if you are not satisfied with the product. The Help tab routes you to the websites tutorial page where tutorials on how to use the features are present in three steps for every feature and the bottom of the page takes has a link to Frequently Asked Questions where some of your queries are answered. Live chat facility is not provided however you can contact them through Email for technical support and the E-mail address is provided in the Contact tab on their website. PDFZilla Version 3 software runs on the major Windows operating systems. It is a pure desktop version and runs on Microsoft Windows Vista, Windows 2000, Windows XP or on Windows ME. It worked on Windows 7 too. It does not work on MacOS, iOS or browser. 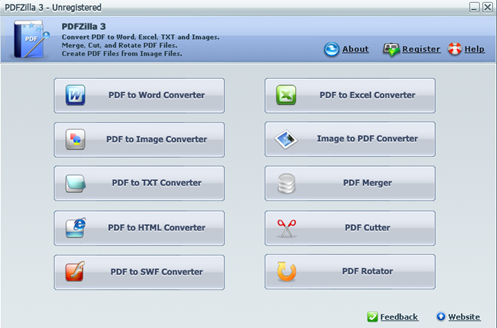 No feature supporting to convert from other formats into PDF apart from image files.